Sometimes the smallest things can cause great harm, especially under the pull of gravity. The unfortunate truth is that many job sites are littered with tools that could fall from a height at a moment's notice. 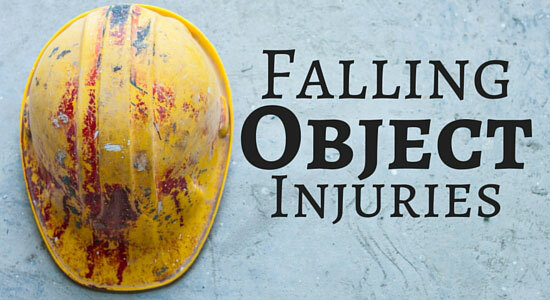 Nearly 17% of all job site related deaths are attributed to objects falling or striking a worker. While safety helmets are often required in work sites, there are times when these helmets just aren't enough. If you or a loved one was injured by a falling, swinging, or flying object on a job site, you may be entitled to compensation for your injuries. If a company sharing the job site was responsible for the dangerous object, you could have more than a workers' compensation claim. Learn more about Third Party Liability and what it could mean for you. In some cases, falling or flying objects can be fatal accidents that rob us of our loved ones. If your family member was the victim of a fatal accident on a job site, you and your family are entitled to take legal action. Learn more about how we can help after a fatal accident; visit our webpage regarding Wrongful Death Accidents. If a falling or flying object struck you or a loved one, our attorneys can help you navigate the uncertain waters of your legal claim. You shouldn't have to suffer due to someone else's negligence. Contact as any time at 1-866-943-3427 or simply complete the form located in the top right corner. If you'd like to chat with one of our representatives, click on the chat box in the bottom right. Our legal consultations are always free, and we're happy to answer your questions. With Edgar Snyder & Associates, there's never a fee unless we get money for you. That's been our guarantee for over 35 years.